Pluses and minuses? Your preference? Tonal characteristics vs. back pain? Impart your knowledge/wisdom here please. I've been playing my 13.5 pound Les Paul Custom since I bought it new in 1979. I never knew that it was a piece of crap Norlin era turd until I went online. Q - Weren't all the early LPs pretty much boat anchors? If so, how does one reissue a 'vintage' or 'traditional' LP but bore tone-sucking holes in it to alleviate sciatica in the 50 plus crowd? It's an issue, to be sure. I personally know guys that can't play anymore because of neck and shoulder problems. I come from the Duke Ellington School Of Tone. Yup. I am only 33(34 in 14 days actually) and have neck and back issues bad enough that limit my playing. Not to mention the hot fire pokers in my left wrist/hand/arm/elbow. If you sit with the guitar supported on the legs, heavy is good. It stays still. If you use a strap, light light light. I am sure there is some difference in sound, though I don't know how perceptible it is. Heck it might sound better. My future project guitars will all feature chambering. One is a 1996 '60 Classic and it's 12 pounds, maple over solid mahogany. One is a 2007 GOW weight-relieved (maple over drilled mahogany) and it's 8 lbs. The other is a 2014 chambered CS R8 and it's 7.2 lbs. Take the rear cover off and you can see into the inside of the guitar body. It does have a solid center block. I got these 2nd hand, and each one totally rocks. With my back not what it used to be, I play the R8 these days. I cannot play the '60 Classic for more than an hour with it on a strap. Weight is not a factor in a guitar's tone and sustain. There are heavy ones that sound great, and there are heavy ones that stink. Same goes for lighter ones. Get what you like and play the devil out of it. That's all that matters. I have a 2010 Studio Faded Brown (chambered) and a 2012 Traditional (swiss cheese weight relief). I love the sound of both of them but they are variations of the Les Paul theme. The difference is in the pups mostly I think, Burstbucker Pros vs. '57 Classics. I tend to play the Studio a whole lot more because it is much lighter than the Trad. The Trad is dammed heavy in comparison and is harder to balance on my leg when playing sitting down, and also has a tendency to want to slide of; I have to play it at a shallow angle to prevent this. The Studio sits better on the leg and doesn't want to slide off. In summary, I generally prefer the Studio because it's less painful to handle but love the tone of both models equally. I have a 2014 Traditional that is 9 lbs even and no weight relief. I can play it as long as I want to and I am in dubious shape physically and 65 years old. I picked it off the wall at EM Shorts and when it came away quickly the weight surprised me. After I fiddled with it for 10 minutes I knew it was going home with me. Goofy 2014 Anniversary inlay and all! I have several Gibson LP's. I have one chambered Gibson LP in my collection. It's an '08 Gibson LP Standard plus, and weights a little over 7 lbs. I love the way it sounds and plays,but I also really like the asymmetrical neck on it. I don't really notice an big differences in the treble on bass tones on this guitar like some claim. The main thing that makes this guitar so enjoyable is the weight. When you're closing in on 59 years of age, you take all the help you can get. I bought a new Standard last year that is, obviously, weight relieved. It’s just over 8lbs. and plays like a dream. I was originally looking at Trads but I never found the combination of weight and top that made me want to pull the trigger. If I find a used Trad with a decent weight I might grab it regardless of the top. I love my Standard. It has the tones I was looking for. I wasn’t drawn to it for the coil tap, but it provides cool tones too. It’s not a coil split. It’s inserting a cap in between the pickup and ground. It kinda moves the tone towards a P90 thing. Looks like a (backwards) PRS without the Poker Chip. Both mine are 2016 Studio HPs (loved the first one enough I wanted a second as the specs are oddball enough it's not something I wanted to have to track down years from now!). Both have the ultra-modern weight relief stuff. I don't have any issues in my health with them the vast, vast, vast majority of the time (and my main Jaguar weighs more than either of them by far due to the offset body and well, boat anchor wood). They sound like a good LP to me, but that's as much the pickups/pickup position/set neck/whatnot as much as anything else, and for me the 490/498 combo is what one should sound like to make me happy. My Gibson LP Trad Pro II isn't light weight, but it's not a boat anchor either. I have a '15 LP Trad Pro that tips the scales at 11.4 lbs. A weighty proposition but it sounds amazing & sustains for weeks. Authority! but I only play it while seated. The heavy body coupled with the 60s profile slim neck makes it a bit tipsy so I have to be careful. 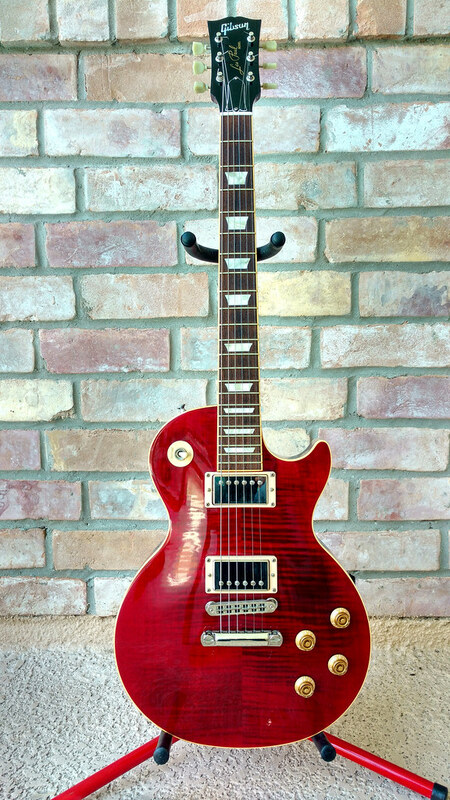 Also a P90s equipped 50s Tribute LP @ 7.8 lbs that's a delight to play and oh so easy on the back/shoulders. Nice big fat neck too. I don't think anyone can honestly say heavier is better than lighter, or vice versa, when talking tone anyway. Too many variables. When I purchased my 2006 R8, the store had about 8 of them and I played them all, extensively, and picked the best sounding one. Honestly, there wasn't that much difference between them (that I could hear). Mine is 8.8 lbs. My 2014 Traditional is a joy to play. The tone is outstanding but I think that has more to do with the 59 Tribute pups and the Orange Drop caps than the weight. But the weight is right in the middle between heavy/light @ 9.0 lbs. The guitar is more "lively" unplugged than any of the others I compared it with that day. None of them were "bad" but this one stood out to me. I know the weight relief subject has been beat to death in the Les Paul world. And I honestly don't think a consensus has been reached. I used to cork-sniff these sorts of topics (NOS tubes is one-such topic). But these days I just live by the "great tone happens" credo. My point is - how much does it matter to me? A bouddy of mine has one of the thin bodied, weight relieved Les Paul Thin guitars. It's the best sounding, most versatile, most comfortable Les Paul I've ever played.